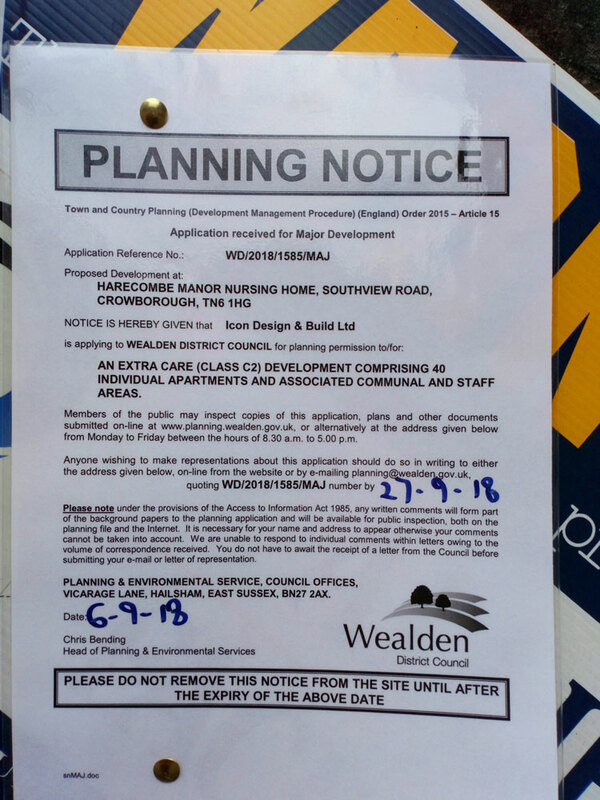 Update (January 2019): This application was refused by Wealden District Council on 26th November 2018. However, as already reported, the applicant ICON Design and Build have appealed the decision to refuse the original application (WD/2017/0909/MAJ). A date for the hearing has now been set. It will held by the Planning Inspectorate at the Council Offices in Hailsham on 22nd January 2019. Click to see the Appeal Documents (in the tab “View Documents” under “Appeal Documentation”). 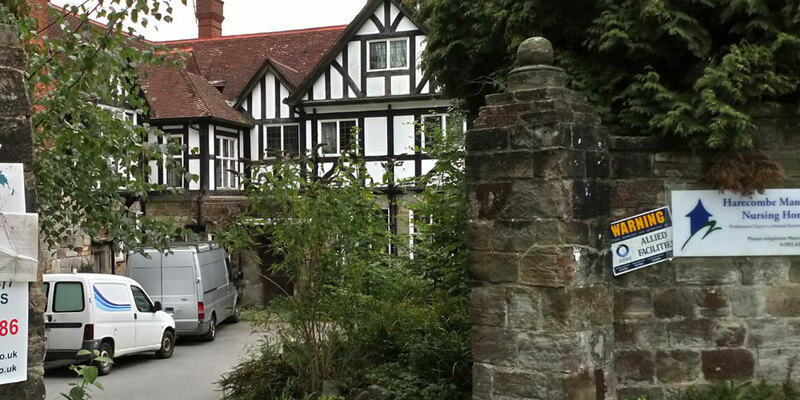 A new planning application has been submitted to build apartments on the Harecombe Manor site on Southview Road in Crowborough. ICON Design and Build based in St Leonards have submitted a revised scheme with more parking spaces and a strategy for dealing with water drainage. The 40 apartments with communal facilities will be provided in three ‘linked’ blocks in a T-shaped design stepping down the sloping site. Six 1-bedroom and thirty four 2-bedroom apartments are proposed. The original stone wall on Southview Road opposite the hospital will be retained. In April this year, Wealden District Council refused to grant permission for demolition of the manor and replacement with apartments. Local people wrote to say they felt modern design was not being in keeping with buildings in the surrounding area. Historic England rejected an application to grant listed status, nevertheless the building was recognised for its contribution to the local character of the area. Also some residents living on Southridge Rise, behind the property, were concerned the development would encroach on their homes. The applicants have appealed to Planning Inspectorate for the decision to be overturned. Harecombe Manor was built around 1903 for the banker John Kirkwood as a substantial country house with landscaped. It was used as a hospital for wounded soldiers during World War I and later served as a residential nursery for the City of London. In recent decades in has been used as a nursing home, but it was closed after adverse ratings from the care watchdog. Originally of an L-shaped design, the report from Historic England states that building adversely affected by room divisions as part of the conversion to a care home, and a large extension added to the south-west. When the previous application was considered councillors on the Planning Committee agreed that the new building would have been overbearing on its neighbours on Southridge Rise and that there was insufficient parking provided on site. It was argued at the meeting that there was a history of flooding and it was believed that the local drainage system might not cope with additional foul waste and rainwater. Now the applicant has submitted a revised scheme with an attenuation tank under the car park for the storage of rainwater from roofs. The Travel Plan states 32 spaces are now proposed instead of the 24 previously as a result of the District Council refusal (although the application form itself states there will be 30 spaces including one reserved for minibus use). The proposed “Extra Care” apartments will be restricted to older persons in need of care (Class 2 as it is termed in planning law). Members of the public have until 5th October to submit their comments (Ref: WD/2018/1585/MAJ): www.planning.wealden.gov.uk.